Neglected Blog – Blame The Cricut! Since receiving my wonderful Cricut Maker in February, my blog has been very neglected! I’ve hardly done any recipes, I’m behind on my reading so I’m behind on my book review posts and I’ve gone days every week without posting. For someone who usually blogs daily, it’s been a little strange not blogging. However, I love being creative with the Cricut and I just want to be making things all the time! I spent all day yesterday making my lovely mother-in-law some pictures to hang on either side of her bathroom door. I purchased SVG files from one of my favourite websites, Dreaming Tree and made six 6×6 inch box frame pictures. I’ve also made a cute paper bunny rabbit that can be filled with Easter goodies! I’ve made cards and box frames for mother’s day presents and I’ve bought loads more files from Dreaming Tree and SVG Cuts that I can’t wait to make! 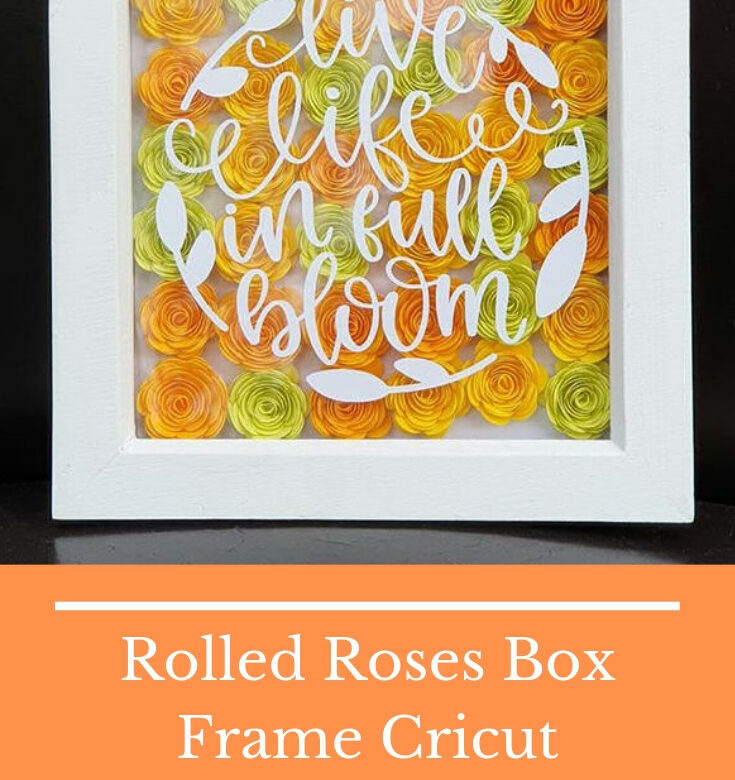 We’ve just celebrated Mother’s Day here in the UK and this year we made my mum, Ant’s mum and Aiden’s step mum a rolled roses box frame. We used the Cricut Maker to cut the roses and vinyl for the front of the frame then personalised them for each person, like the one below. We loved how nice they looked so I decided to make a small one for us, to celebrate the coming of Spring. The following tutorial is picture heavy to make it easier for beginners to follow along. A box frame. I used a 6×6 white frame from The Range. Medium Cardstock in your choice of colours. A glue gun and glue sticks. Open Design Space and click on Images. In the search box, search for #M3D7E1. This file is free for me because I have Cricut access. I’m not sure if you have to pay for it if you don’t subscribe. Click on the image of the spiral and click on Insert Images. The image will open in Design Space. Click on Duplicate and move one spiral underneath the other. While holding the Shift key, click on each layer so that they’re both selected and click on Attach at the bottom of the layer palette. This will keep your images in the right place when you click on Make It. Click Save and name your file. Click Make It. Design Space will prepare the mats and you can change some options here before starting to cut. I wasn’t sure how many copies I would need but I estimated around 30-36 should do. Set the number of copies you will need for your frame and click apply. Click Continue. Design Space will work out how many it can fit on a 12×12 sheet of card and will tell you how many mats you will need to cut. I wanted to cut mine on A4 paper because I didn’t have enough of the same colour sheets in 12×12. I went back to Design Space and duplicated the image until I had 6 flowers and arranged them vertically rather than horizontally. When you’ve set your number of copies, click Continue and select your material type. I’m using a light cardstock. I’m using the green mat throughout. The Load button will start flashing on the Cricut Maker when your material type has been selected. Hold the mat and apply gentle pressure while pressing the Load button then let go and let the mat load. When the machine is ready, the Go button will start flashing. Press the Go button and let the machine do the job. When all the spirals have been cut, it’s time to start assembling the roses. Using a quilling tool, slide the outer end of the spiral into the tool. Roll the spiral gently and try to keep the edge of the spiral lined up. When it has all been rolled, slowly let go and let the flower unroll until it’s the shape you want it. Hold the flower and turn it upside down. Apply hot glue to the last circle of the spiral. Press the circle onto the bottom of the rolled rose. Your first flower is now finished. Only another 30 or so to go! When all the roses have been made, cut a piece of white paper to the same size as the inside of your frame. Attach the roses, using hot glue, in any design you wish. We did 3 lines of different colours on the first ones we made for Mother’s day, but this time I wanted it to look a bt different so I placed them on randomly. It’s now time to cut the viny for the front of the frame. I used a free download from lovesvg.com for the spring vinyl design. Download the file and unzip it. In Design Space, click on Upload file. Click on Browse and browse to the folder where you unzipped your file. The image will open on the canvas in Design Space. You can resize the image by clicking and holding the circle with the arrows and dragging it to the required size. Make sure all the layers are selected and click on Attach at the bottom of the layer palette. The image will turn to all the same colour. Clicking Attach tells the software that you want it to keep the image as it is. If you don’t click Attach, the software will rearrange the image on the mats to save materials. If your laptop is still connected you can just choose Vinyl for the material type. If not, connect your laptop or phone to the machine. Follow the instructions to load the mat and start the cut when the machine is ready. There’s a progress circle to show how much cutting is left to do. Unload the machine when the Load button starts to flash again and remove the vinyl from the mat. Peel away the excess vinyl. Weed the tiny areas in the letters with the weeding tool or a pair of pointy tweezers. The eagle-eyed amongst you will notice that I missed a bit in the F on Life. Don’t worry if this happens, you can weed it using the weeding tool of tweezers once it’s been applied to the frame glass. When it’s all weeded, cut a piece of transfer tape big enough to cover your design. Stick the transfer tape to the design and rub over it using the Cricut scraper tool. Remove the backing from the vinyl and place the design on the glass. Using the scraper tool again, rub over the whole design. Whilst you need to apply pressure, make sure you don’t apply too much and break the glass. I’ve found the easiest way to remove the transfer tape is to pull it back on itself, keeping it flat on the glass. Go slowly and use the scraper for any stubborn bits that didn’t stick. We’ve rounded up some Christmas craft ideas for children of all ages from the craft advent posts we did a couple of years ago. KayCee and Ella had great fun making all these crafts and did an excellent job. We had the hottest Summer this year than we’ve had for a long time. Just about everyone loved it. I didn’t. I’m not a Summer lover and have to say I was glad when Autumn arrived! Autumn, however, brings with it rainy days and if we don’t have some ideas to keep everyone occupied, we all end up watching too much TV. Here are some things we enjoy to do when it’s rainy outside. Family Board Game Day – KayCee collects Monopoly games so we have plenty of different kinds to choose from. Design A Family Board Game – KayCee and Ella had great fun making a Very Hungry Caterpillar board game when they were younger. It’s a great way to spend a rainy day and at the end, you can all play the game together. Make Your Own Moon Sand – I’ve never tried this, but I really want to. I think I’d have as much fun playing with this as Ella would! Baking – A rainy day activity list wouldn’t be complete without baking of some sort, whether it be cakes or cookies. 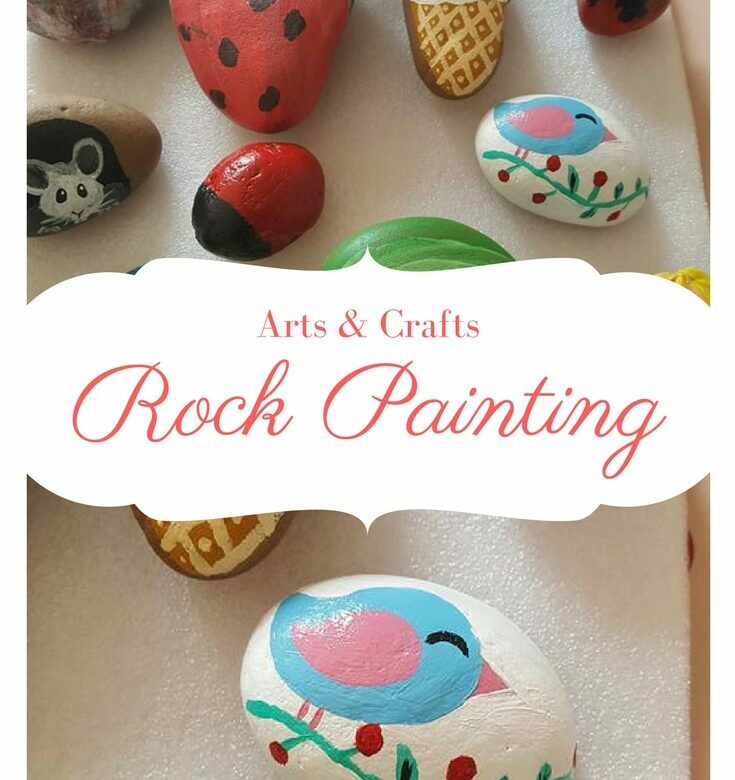 Rock Painting – We did this last year and everyone enjoyed it, including me. We still haven’t varnished our rocks yet so we’ve not been able to put them in the garden. We’ll have to do it soon because they’re too nice to be stuck in a box! Indoor Treasure Hunt – Ella and her friends often make treasure hunts for each other. They choose a prize and hide it then write a series of clues for the other one to follow. You can also get loads of printables from Google if you wanted to create one for your children but didn’t want to write all the clues yourself. Washable Stained Glass Window Painting – The lady who writes this blog put the tape on the outside but obviously, that won’t work if it’s raining. This can be done indoors as long as you protect the floor under your window. Make Gloop – Cornflour, water and some food colouring can keep children entertained for hours with homemade gloop. Make Some Story Sacks – Ella loved bringing home a story sack when she started nursery. I’d never heard of them before, but thought they were a brilliant idea. You can make them for all ages and stages of development. Get Outside & Play In The Rain – When I was a child my friend and I used to go outside in bare feet and squelch our toes in the mud when it rained hard! We loved it when the rain was pounding so hard it bounced when it hit the floor! What kind of things do you like doing on rainy days? It’s Father’s Day here in the UK on Sunday, June 17th. Ant prefers homemade Father’s Day gifts so I’ve picked out a few ideas from Pinterest that the children can make for him. If you’d like more ideas, I have lots of pins on my Dad Gifts Pinterest board. KayCee and Ella love making their own cards and there are loads of ideas on Pinterest. Check out HomeSchoolPreSchool’s Pinterest boards. Ant loves all kinds of nuts so this would be a great gift for him. If you can’t find a big tub of nuts like this one, you could buy a cheap Kilner jar and fill it with his favourite nuts. We have different coloured lolly sticks that we got from The Works so we wouldn’t need to paint them. It’s quicker but less fun for the children! Ella would love making this because she likes being able to use the hot glue gun! You can find the tutorial for this craft on Mama Of Many Blessings. KayCee and Ella love rock painting. This is an easy one for little ones to do. We did loads of rock painting last summer. We planned on putting them around the garden. Unfortunately, we never got around to coating them with varnish so they’re still in a box somewhere. I really must get that sorted because they’re too nice to be hidden away in a box! Finally, we have a cute little bottle filled with Reece’s Pieces. Mind you, if the children made for this Ant, I don’t think he’d see many of them…..Reece’s Pieces are my favourite! I hope you have fun making a gift with your children, however, if you just don’t have time to make a gift this year, I’ve seen some great gifts at places like Argos and B&M. Before buying from Argos I always check online for promotions and discount codes. Usually, you can save up to 25% or £50 off. I have a Nikon Coolpix camera at the moment. I would LOVE this camera and it’s going on my ‘when we win the lottery wishlist’! I stumbled across diamond painting on eBay while looking for some cross stitch kits. I’d never heard of it before and wasn’t exactly sure what it meant when diamond painting cross stitch! YouTube showed me exactly what it was and I was intrigued. I’ve not done any cross stitch for a while and only recently started doing it again. I enjoy it but it sometimes feels like I’ve been working on it forever and not really getting anywhere. Plus, the tiny chart with all the counting can be a bit stressful. I’m forever losing my place and having to count over and over to make sure I’ve got the right square. Diamond painting has the chart right there on the picture. Basically, you stick tiny plastic, flat-backed rhinestones onto the chart. The canvas has adhesive already applied and the rhinestones are in numbered bags. Using the tool supplied, you pick up a rhinestone and stick it on the right number. My next one is another Santa picture and I can’t wait to start it! I bought all my kits from the same seller on eBay. They were all less than £3 each with free posting. I did have to wait a couple of weeks to receive them because they came from China but it’s worth the wait. I have lots more in my basket waiting for me to click the BUY button!! I still have one of my miniature dollhouse kits to make but I’m taking a rest from them as they’re not as stress-free as the diamond painting! A few weeks ago I browsing Facebook when I saw a link to some Box Theatre Kits on Amazon. I’d never heard of them but I fell in love with them. They’re little tins with miniature scenes inside. I headed over to Amazon and ordered 3 different designs! Ant said I should have ordered 1 first to see if I liked doing them but I’m an impulse buyer! While waiting for them to arrive (they came from China so took a while) I saw some more on eBay that were less than half the price they were on Amazon. I ordered 3 more and kept my fingers crossed that I was going to enjoy doing them! Thankfully I love doing them, as does Kaycee! Ella wanted to do one so I said we could do one together. She did really well but she hasn’t really got the patience like Kaycee has and she said she’s not interested in doing anymore! and I made Snow Dream. I was supposed to be making it on my own but Ella wanted to help! 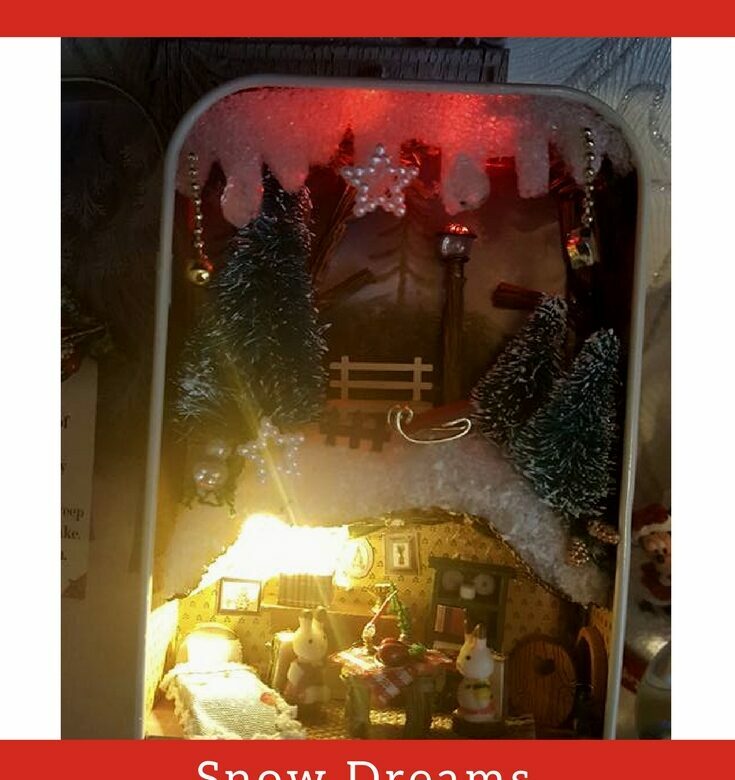 I’ve also ordered some Christmas room dollhouse kits. I can’t wait for those to arrive! Daisy Made makes it on to every bucket list we make and it wouldn’t be the summer holidays without a trip there. Ant posing in his new Cool Daddy t-shirt! We took Nanny to Daisy Made this week. She’d never been before and she now loves it as much as we do! We didn’t stay long because the weather turned from lovely sun to chilly wind not long after we got there. The girls like playing crazy golf when we visit but I didn’t fancy standing in the wind for an hour while they played. I don’t play because I don’t really enjoy crazy golf! While working at the charity shop I came across an unused set of acrylic paints. I didn’t have a use for them when I bought them, I just figured it would be good to have them. While browsing Pinterest I saw some lovely rock painting designs. I knew Kaycee and Ella would love having a go at rock painting and I was right. We spent a really lovely afternoon together creating lovely rocks for the garden. I think this is going to be one of our rainy day activities. We’ve got loads of rocks in the garden around the pond.